A scholarly, if sometimes slapdash, historical commentary asserting that the available evidence strongly suggests that modern Romanians are descended from third-century Romans. Saying Romanian history is complex would be an understatement. As this book attests, it is in fact bewildering and loaded with unanswered, perhaps unanswerable, questions. Dacians, Romans, Barbarians, Magyars and all manner of conquering and itinerant peoples trek through its often unwritten history. Contradictions and competing interpretations abound. Into this morass comes a formidable debut from Davidescu, a Princeton graduate student whose name bespeaks Romanian roots. With humorous asides, Davidescu offers his well-footnoted take on a classic “who was there first” controversy that has embroiled historians for hundreds of years. What seems to be uncontested is that Rome annexed Dacia, a kingdom roughly encompassing what is now Romania, in the year 106 and evacuated the province in or around 271 as Goths swarmed the gates. But did many of the Roman soldiers and colonists hunker down and remain behind, perhaps because they had by then intermarried with Dacians? Or was the evacuation more or less total, and did the people called Romanians immigrate much later to form an underclass in areas that include Transylvania, where the Magyar forbearers of modern Hungary long ruled? Davidescu, emphatically a believer in Daco-Roman continuity, exhausts sources both modern and ancient in making his case for the continuity theory. Along the way, he pokes fun, sometimes derisively, at immigration theories popular among Hungarians, who lost Transylvania to Romania after World War I and never got over it. The quality of Davidescu’s scholarship is hard to assess for anyone not steeped in this contentious, obscure history whose resistance to clarity cannot fairly be blamed on him. That said, what’s needed here is basic proofreading to weed out persistent mistakes that give his text a messy quality. 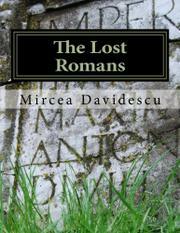 “Dacia was seen for its early history seen as a defensible and prosperous province,” he writes in one typical example. The book also seems to vacillate between being a somewhat jocular popular history accessible to lay readers and being rigorously academic. In the end, it’s not quite either. A worthy effort by a youthful author whose best work on Romanian topics may still lie ahead.